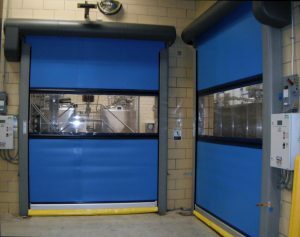 The Plexline high-speed, high-performance door is as visually pleasing as it is durable and functional. Designed for interior use this product is made of fiberglass composite materials that mimic the benefits of stainless steel but is more cost-effective. The Plexline direct-drive motor opens the door at up to 50 inches per second improving traffic flow, productivity and energy conservation. It is simple to operate and requires only a small footprint of warehousing space. For additional information and a list of features, options and benefits, contact E-Distribution.